When it comes to customer service, quality and convenience have become baseline expectations. According to PwC1, nearly 80 percent of American consumers say speed, convenience, knowledgeable help and friendly service are the most important elements of a positive customer experience. The report also found employees are not meeting customers’ expectations, stating only 38 percent of U.S. consumers said the employees they interact with understand their needs. One assumption is lack of mobility. Employee mobility is often referred to as a job “perk”, enabling employees to be more flexible and stay connected while away from the office. Some businesses think mobile devices are more of a distraction than a work tool. However, forward-thinking companies are realizing the many benefits of mobile applications. Research shows that employee mobility leads to a 30% improvement in processes, a 23% improvement in productivity and 100% improvement in employee satisfaction. Mobile tools are transforming how employees work and access the information they need while away from their desk. Earlier this year, Forrester reported that companies who succeed in customer experience, are those that empower their employees with information and autonomy. We’ve seen this play out first-hand at Windstream Enterprise. It’s one thing to offer our UCaaS solution OfficeSuite UC®, but it’s more significant when we see the platform work for ourselves. When employees have access to real-time data and communication capabilities with customers and colleagues, obtaining answers to customer inquiries are more seamless, improving employee productivity and most importantly, the customer experience. Let’s analyze a few scenarios. Field technicians. A field technician’s primary job is to go to customer locations to troubleshoot or install services. Quite frankly, field techs can be the face of your company. They sometimes have more interaction with customers than any other employee and this experience leaves a lasting impression. When field techs are not only equipped to complete the task at hand but can also access up-to-date account information and answer questions while on-location, it enables a new level of service. This service sure outshines the days when techs were forced to go out to their vehicles to try to call the corporate office, or worse, told customers to call themselves. Salespeople. It’s no secret that a successful salesperson must function efficiently outside of the office. But with today’s technology, it’s no longer a game of trying to bounce in and out of the office to catch up on missed calls and emails. Unified communications features like call twinning, SMS messaging, softphones and mobile conferencing are ensuring salespeople are always accessible at one business phone number and never miss the next big opportunity. Business continuity. We see the benefits of this all the time first-hand with our customers. Whether due to a natural or manmade disaster, closures of any kind can have grave and costly consequences. When employees can continue to answer customer calls, change greetings, access voicemail and email, and even meet with customers via video conferencing remotely, business continues, employees are productive, and the customer experience remains intact. Let’s talk more about the impacts on productivity. How many times a day (even on weekends) do you check your work email on your phone simply because it’s easy to access? In the past, how many times outside of business hours, did you check your work email? I’m betting not as many because it required you to either go to the office or sit down at a computer. Mobility allows business to carry on outside of business hours without employees feeling burdened by spending extra time “at work”. In fact, many companies are using mobility to lower overhead costs. Why lease expensive office space if your employees can conduct all their business in a professional way from home or on the road? The latest unified communications as a service (UCaaS) platforms integrated with other applications, such as CRMs, make this possible. We know this to be true, employees are happiest, and productivity is highest when employees have access to the tools that enable them to work efficiently. For any organization looking to streamline processes and improve how and when you serve your customers, unifying your employees, locations and systems is a good place to start. in-store interactions and behaviors, paving the way to an improved customer experience. 80% of millennials (we are talking customers that are currently in the 24 to 38-year-old age range), as well as half of ALL shoppers, use their mobile device while in stores to compare prices, look up reviews or check local store inventory. 90% of Gen Z-ers (this is the current “up-to-23-years-old” group) say that in-store WiFi is absolutely critical to their shopping and dining experiences. 80% of millennials prefer scan-and-go technology (scanning their items as they shop, then paying via app – no standing in checkout lines) but only 3% of retailers currently offer this. 49% of all diners say WiFi availability is a major factor in determining where they eat, while 51% of millennials look up tips on what to order and restaurant reviews while in the restaurant, and 23% of them share pictures and content from within the restaurant. 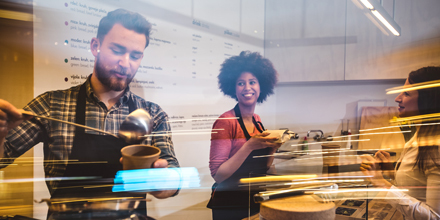 Customers are more likely to engage with your business digitally with WiFi access in place – they will gladly connect with you in exchange for instant in-store promotions or loyalty rewards. A strong WiFi solution also enables your staff to use tablets to assist customers in checking on inventory, and checking them out via mobile POS which brings the interaction to the customer, rather than the customer having to seek out associates at a register. This type of uninterrupted interaction leads to a higher likelihood of purchase and an improved customer experience. What about all the intelligence you can gather via your WiFi solution? WiFi usage data: Provides information on device types, how long visitors use the network, return or frequent visitors, traffic patterns, etc. Demographic data: Delivers information such as age, gender, income, interests, etc. that helps build out a customer profile for future customized targeting. Collect this data via a WiFi access splash page (which also provides some prime real estate for promotions) or use social WiFi as an access method – requiring they “like” your store/restaurant’s Facebook page or tweet, something about your business in order to access WiFi – this connection of a social media profile to an otherwise anonymous device delivers lots of valuable demographic data. You might send a special coupon for a free dessert (or whatever your business provides) to a frequent visitor thanking them for their loyalty to your business. You might send a customer a birthday coupon (you know this because at some point they used their social profile to interact with your WiFi). During the holiday season, you may push out a notification to all shoppers logged onto your network letting them know which registers are currently free or have little wait time. Obviously, the more data you gather, the more customized you can be. But, even broadly speaking, your WiFi solution makes it easy to promote events and offers to your customers. Smaller businesses tend to be nimbler, allowing them to make the digital transformation a bit easier than larger geo-dispersed operations, and investing in a smart WiFi access solution does not have to break the bank. While some of the trends mentioned (such as mobile scan-and-go technology) are a bit more involved than simply providing free WiFi to customers, most of these topics stem directly from simple in-store WiFi access via an analytics-focused WiFi solution. However smaller businesses are less likely to have IT departments – specifically local retailers, franchisers and restaurants. This makes ease of installation and ease of access to the analytics of paramount importance. We all know that if customer experience is a top priority, security is right up there with it. While the subject of this blog post is focused on harnessing the power of WiFi analytics and meeting customers’ digital in-store expectations, it is not lost on us that you must provide a highly secure “intelligence-gathering” WiFi solution. While that’s fodder for another post entirely, rest assured that secure WiFi solutions that are simple to install (really, just plug and play) do exist. Solutions like Secure WiFi & Analytics, can do just this – provide in-store WiFi that meets customer expectations while gathering usage, foot traffic and demographic data which is accessible through a simple cloud-based management tool – all while being protected by WIPS (wireless intrusion protection system), meeting PCI compliance standards, and featuring “zero-touch” plug-and-play installation. To further guarantee security, you can also run your WiFi off a private, secure MPLS network. A little WiFi can go a long way when it comes to improving your customer experience. In fact, I would venture to say it’s probably the lowest hanging fruit out there when discussing customer experience and digital transformation for SMBs. A customer walks into your office and while they’re waiting, they attempt to access WiFi. They manage to get online, but complain your Internet is slow. Then YOU notice your connection is slow, too. Has this happened to you? As consumers, we’ve probably all experienced it some point. The problem isn’t just slow Internet, so calling your Internet provider won’t fix things. The culprit is likely your network. In addition to your customers, your own employees serving your customers are trying to access it, too. All of that activity drains bandwidth and puts a strain on your network. Not to mention people’s patience, their impression of your company, and their likelihood of doing business with you, or working for you, in the future. The days when your network was just a bunch of wires and boxes that connected people together and to the printer are long gone. Today your network is a critical lifeline to cloud-based applications and data that empower your entire organization to get things done. Anything that slows that network down can lead to lost opportunities, lost connections and lost revenue. The first step to addressing the problem is finding out the root cause which usually comes down to one of these basic issues. Does any of this sound familiar? 1. Current bandwidth is misallocated across existing applications. The good news here is, it doesn’t necessarily mean you don’t have enough bandwidth. It just means too much is being dedicated to applications that don’t need it, while too little is set aside for apps that truly demand it. 2. Unnecessary network traffic. Entertainment apps like streaming music, social media and YouTube really soak up bandwidth. It may not be realistic to completely blacklist them, but rules should be created to ensure they get bandwidth AFTER your truly business-critical applications. 3. Over-provisioning bandwidth based on vendor recommendations. Similar to issue #1, many times we don’t test the impact of a new application on the network. We simply read the vendor estimates it requires “X” amount of bandwidth, and we assign and forget it. This frequently results in too much bandwidth being allocated to one application causing your other apps to suffer the consequences. 4. “Shadow” applications you don’t even know about. This covers a lot of scenarios, but let’s start with the ominous-sounding “shadow IT”. This is simply when users in your organization sign up for a cloud-based subscription of a legit program and start using it – paying for it monthly on their company credit card – WITHOUT (here’s the important part) letting IT know about it. They aren’t trying to be workplace super-villains, but, still, the usage puts a drain on the network. And IT can’t control something they don’t know exists. 5. Lack of visibility and control. Really this just sums up the above four issues. Without the ability to see into application usage across the network, you end up with misallocated and/or over-provisioned bandwidth, and/or being sucked up by personal/entertainment media and cloud-based shadow apps you are unaware of. Getting visibility – if you have technology to support it – is the first step to addressing the challenge. Then prioritization and policy/rule creation – again given the right technology – is the second. While this certainly isn’t an exhaustive list of things that might be slowing down your network, there are certainly improvements that would go a long way in making your bandwidth work harder for you if you could address them. Check out the e-book “What’s Holding Your Applications Back?” to read more about how to correct these five bandwidth-suckers. While the problems themselves are conceptually simple, they weren’t easy to address until recently (which explains why they’re so prevalent). The rapid uptake of SD-WAN adoption provides convincing evidence of just how common these problems are. Thanks to the technology in SD-WAN, IT leaders/managers can see which applications are draining their bandwidth. Identifying the problems is the first step in optimizing the performance of your network. Making the move to SD-WAN is an easy decision, but the technology is different than anything that’s come before. Many organizations find a fully managed solution such as Windstream SD-WAN Concierge makes the process of moving to SD-WAN a lot easier and frees your own team to focus on even more strategic challenges which is a huge help for companies trying to build competitive advantage through digital transformation. SMB/Mid-Market Spotlight: Is there a better solution to your bandwidth deficit than purchasing more bandwidth? Operating a business in the world of social media, software as a service (SaaS), mobility, video conferencing and more is no small feat. Most businesses find themselves faced with choppy VoIP connections, dropped video conferences, slow access to business systems and applications and other counter-productive bandwidth related issues. Do you know what’s consuming your bandwidth? Do you have the budget to purchase more bandwidth? Research shows that the demand for bandwidth inside a business doubles every 18 months. What to do? This steady increase in bandwidth demand does not magically align with a larger budget to purchase more bandwidth. While it seems the obvious solution is to purchase more bandwidth, there’s actually a smarter, more affordable solution. SD-WAN. If you are not familiar with SD-WAN, check out this infographic. SD-WAN can free up bandwidth on your existing connections without you dishing out more money for additional bandwidth that will just be misallocated in a similar fashion. SD-WAN becomes the smart investment, while not always the obvious one. Deploy SD-WAN and gain visibility into which applications are draining your bandwidth. Then set rules that prioritize the bandwidth allocated to each. This means that Bob’s incessant YouTube streaming doesn’t pull bandwidth away from your VoIP calls or video conferences that are working to win you new business (not to mention you know about that now and can put a stop to it). With your newfound network insights, anticipate spikes and surges and plan proactively. Not only is SD-WAN a quick fix to your bandwidth issues – offering up to 100x the bandwidth at a lower cost than the T1 you may currently be paying for — but it also sets your business up for future success – laying the foundation for other software-delivered solutions and delivering a network optimized to connect to cloud-based applications. As a new year begins, it’s a good time to reflect back on 2017, the year of SD-Everything. Software-defined networking and virtualization became a reality for many businesses in 2017. The migration to the cloud has been talked about for years, but now most businesses have officially arrived. The majority of medium businesses are using cloud-based applications for some combination of storage, communications, collaboration, accounting, inventory management and more. Nevertheless, for some, switching to the cloud still seems like a daunting task. However, the trend is not reversing and in order to maximize your IT investments and keep current with the times, the move is inevitable. 2018 holds the advancement and proliferation of cloud-based technologies and also puts a big focus on not only the customer experience, but also the employee experience. Here’s what we can expect to see in 2018. 2017 was all about early adoption of SD-WAN with a focus on using low-cost broadband Internet connections to reduce overall bandwidth costs, increasing network performance and gaining deeper network visibility. 2018 is all about taking network management and monitoring to new heights. Never before have companies had such granular visibility into what’s going on inside their networks and the ability to prioritize applications accordingly. Optimization is king in 2018. No byte of bandwidth goes to waste. Research forecasts that SD-WAN adoption will increase to 90% by 2020. As more SMB & mid-market businesses migrate to an SD-WAN environment, it’s important they look for a partner that is well-versed with the technology to get the most possible value. Our own SD-WAN Concierge Service is an example of the type of solution that removes the initial complexity which can be a challenge, even for an experienced IT organization. Data breaches are the new norm. The problem is that about half of SMBs still don’t take cyber attacks seriously enough. In 2018, one thing is for certain – you will likely become a target of a cyber attack if you don’t have appropriate security measures in place. Finding SaaS solutions that have built-in security features are highly beneficial to small and medium businesses. Many small businesses plan to add employees in 2018, and point to a booming economy as the reason why. As in many other aspects of their business, they will find technology to be on their side. Gone are the days when hiring was limited to your local candidate pool. With the adoption of cloud-based services such as storage, file sharing, video conferencing and real-time collaboration businesses can pull top talent from across the globe. Not only that, but SMB & mid-market businesses are actually saving on overhead costs by “branching out” and hiring remote employees. Along these same lines, mobility solutions are becoming a must-have for employees – thank you, millennials, for this trend. Studies show enabling mobile flexibility – integrating office communications with BYOD smartphones, for example – leads to more positive employee engagement as well as greater productivity. IDC estimates 72% of the U.S. workforce will be mobile workers by 2020. Businesses need to be prepared to attract top talent by offering technology that meets employee expectations. There are many ways to enable employee mobility, but for SMB & mid-market businesses, the simplest and most cost-effective route is to choose a fully integrated UCaaS service (our own OfficeSuite UC is a good example) that enables mobility right out of the box while delivering calling, faxing, voicemail, online feature management, centralized administration and more. A solution such as this makes for happy employers and happy employees in 2018. Another hot topic for 2018 is gathering and then making use of customer intelligence. For example, knowing the web browsing behaviors and shopping patterns of your customers can help SMB & mid-market businesses make better informed decisions and improve and personalize the customer experience. The right WiFi solution can also provide your business with valuable data on your customers’ in-store online browsing/shopping behaviors. A solution like Windstream’s Secure WiFi & Analytics provides more than just a secure WiFi connection to your customers – it’s a great means to analyze shopping patterns, engage customers with loyalty programs, showcase the latest promotion or sale and achieve social media interaction. 2018 is shaping up to be a big year for the advancement of the most current network and communications technologies. Has your business laid the foundation for these advancements with a cloud-ready network that will allow you to take advantage of these trends? A trusted third party resource or network service provider such as Windstream Enterprise can be a great place to start to capitalize on these trends and use them to drive your business forward this year and beyond.